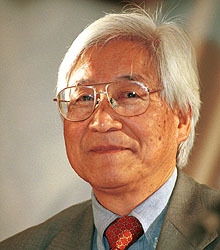 The late Japanese Christian theologian Kosuke Koyama (click HERE for NYT obituary) said, “There is only one sin, and it is exceptionalism.” Koyama was baptized during the bombing raids of Tokyo in WW II. As the bombs exploded and the building burned around the church, Kosuke’s pastor looked him in the eye. “Kosuke,” he said, “You are a disciple of Jesus Christ. You must love your enemy… even the Americans.”Koyama first saw the myth of exceptionalism in the Japan of his youth where the Emperor and the Divine were hand-in-glove. Japan was an exceptional people that could not fail. In his later years, following his retirement from Union Theological Seminary in the City of New York, “Ko,” as his friends called him with great affection moved to Minneapolis. During the 15 years I knew him, he shared his greatest sadness that the ideology of exceptionalism he had experienced as a boy in Japan he now saw in the United States. Today in 2012 political candidates cunningly appeal to the myth, believing that doing so will rally true believers to cast their votes for them as the truest believers in America. Steve Shoemaker sent this piece today. and forget, too, the international.